OVERLAND PARK, Kansas - April 8, 2015 - BLACKHAWK!® announces its new Appendix Reversible Carry (A.R.C.) Inside the Waistband (IWB) Holster for civilian and law enforcement concealed carry. The holster’s design offers concealed carry users and professional operators who prefer the appendix carry position with a versatile and comfortable holster in one model. The new holster will debut at the 2015 NRA Annual Meetings & Exhibits, April 10 to12 in Nashville, Tennessee. The A.R.C. IWB Holster is designed to be as comfortable as it is versatile. The Urban Grey holster body is constructed of a soft, yet durable, injection-molded polymer material for all-day comfort. 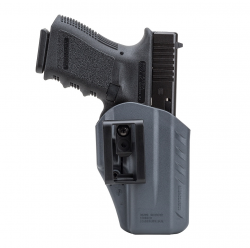 The fully reversible and ambidextrous holster accommodates left- and right-handed users and is packaged with two cant and ride height adjustment belt clips for 1.5- and 1.75-inch belts. A passive retention detent with adjustment screw allows users to vary the amount of friction for personalized firearm security. The holster can be used in conjunction with pistols featuring rear-mounted red dot sights. The new A.R.C. IWB Holster presents both law enforcement and civilians with a deep concealment holster at an economic price. The first models available will fit a variety of full-size and compact Glock pistol models and will be followed by holster models for the Smith & Wesson Shield and Glock 42. The A.R.C. IWB Holster is made in the U.S.A. and has a MSRP of $22.45. Attendees of the 2015 NRA Annual Meetings & Exhibits are encouraged to stop by the BLACKHAWK! booth No.1524 (Vista Outdoor Inc.) to learn more about the new holster and other BLACKHAWK! gear.